Much can be done to help credit markets and troubled banks - even if Congress can't agree on bailout. NEW YORK (CNNMoney) -- A day after the House's surprise defeat of a $700 billion financial rescue bill, talk grew louder about alternative government steps that could help battered credit markets and stave off broader problems in the economy. Among the proposals policymakers are discussing: Change rules to ease the capital burdens on banks; make more FDIC insurance available to bank customers; and cut short-term interest rates. In fact, the first changes came late Tuesday afternoon in announcements by two principal agencies. The Securities and Exchange Commission and the Federal Accounting Standards Board issued new guidance to companies about how to value securities when the market for them vanish. The issue - how to put a value on assets that nobody wanted to buy - is central to the credit crisis. Banks and securities firms have written down $500 billion worth of mortgage-backed securities as home prices fell and foreclosures rose. According to the new guidance issued Tuesday, when the market for such securities dries up, companies can value them based on their estimated future cash flow. Some experts blame the previous rules, known as mark-to-market, for the credit crisis. "The SEC has destroyed about $500 billion of capital by their continued insistence that mortgage-backed securities be valued at market value when there is no market," said William Isaac, a former chairman of the FDIC. "It's way below their economic value. And because banks essentially lend $10 for every dollar of capital they have, they've essentially destroyed $5 trillion in lending capacity." But others argue the accounting change will come at a cost. They say without those strict rules, investors would be more reluctant to invest in banks - and make it even tougher for the banks to attract new capital. The SEC wasn't the only regulator busy taking action on Tuesday. 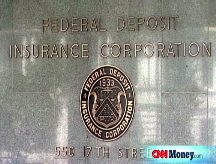 The Federal Deposit Insurance Corp. proposed raising the cap on bank deposits insured by the FDIC. "A temporary broadening of the FDIC's guarantee will provide some additional needed confidence in the marketplace," said Sheila Bair, FDIC chairman. Presidential candidates Barack Obama and John McCain had called for raising the limits earlier in the day. The current limit - $100,000 in most instances - has been unchanged since 1980 despite inflation. It protected as much as 82% of deposits in 1991 but today it only covers 63%. Give banks the chance to exchange loan notes for FDIC notes, which be more valuable and allowing the banks more flexibility to make loans. Purchase on a massive scale mortgage-backed securities issued by finance giants Fannie Mae and Freddie Mac. Clearly, the controversial $700 billion bailout package - which would give the Treasury Secretary authority to buy distressed assets - is not the only way to unfreeze troubled credit markets. But it's also true that none of the proposals is without downsides and dissenters. Gramley, the former Fed governor, questions the wisdom of getting rid of mark-to-market accounting. He would rather see the FDIC and other regulators relax their rules governing the ratio banks must maintain between capital and loans on their books. Those rules are choking off credit to good customers, he said. Gramley said he knows of a businessman with strong credit and a $20 million net worth who was rejected for a renewal of a $1.8 million business loan. "The bank told him, 'Our regulators are requiring us to improve our capital ratios, but we can't raise capital because the market is shot,' " Gramley said. Former FDIC chairman Isaac argues that changing capital ratio requirements or easing other regulations would only lead to deeper problems down the road. "That simply doesn't play well," he said. Meanwhile, the Bush administration's push for its big rescue plan continued on Tuesday. "The alternatives are good - I don't think they do any harm," said Brian Gardner, the Washington analyst for KBW, an investment firm specializing in financial services. "But none of them are as powerful as the rescue package would be." 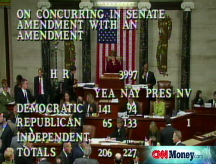 The Senate plans to vote on the $700 billion bank rescue plan Wednesday evening. Stocks rallied on Tuesday as investors believed that Congress will still approve the bill. Credit markets stayed very tight and banks are still reluctant to lend to one another. "It doesn't fix everything," said Hogan. "It doesn't force the institutions to lend to each other or lend to consumers and businesses. That's why they'll hold onto these alternatives. I think you need to keep dry powder if you have to use them in the future." Hey, it's bigger than Wall Street!